Guacamelee is a great game. It’s funny, good looking and a total no-brainer for those with a PS3 and a PS Vita thanks to the cross-buy and cross-save features. Frustrations with the difficulty spikes and later parts of the game do the whole package a disservice. Sometimes the frustrations get too much and it’s either a controller becomes confetti or you walk away for a little while. Guacamelee is one of those titles that just highlights how far independent development has come over the course of this generation. Drinkbox Studios bring us yet another charming and colourful title (after the wonderful Mutant Blobs Attack last year on the Vita) that is just dripping in style and charm. So in this adventure-puzzle-platforming brawler you play the role of humble, yet inexplicably buff, farmer Juan Aguacate. He’s minding his own business, happily dribbling over the Presidente’s daughter and dreaming of being a Luchador. Suddenly the Presidente’s not so humble abode is attacked by beings from the undead realm. In his attempt to stop the kidnap of El Presidente’s daughter Juan is killed by skeletal mad-man Calaca. Resurrected and handed a mystical Luchador mask Juan returns to the living world to rescue his love. Now if you’re thinking “hey this sounds an awful lot like a game I played years back!” then you’ll almost be right. Guacamelee has taken a massive step back to the classic days of 8 and 16-bit style gaming whilst injecting the look and tricks of a more modern game. There is plenty of traditional platforming and environmental puzzling action. Ridiculous mini-boss villains and tons of “in the know” games for those familiar with the world of gaming or have a passing knowledge of recent internet memes. Graphically Guacamelee really stands out. Sure it’s “only” a downloadable title but that doesn’t stop it being a strikingly beautifully designed game that squares up the Mexican-vibe with a keen comedic wit. It reminds me very much of playing Grim Fandango in the way it looks. Animation is smooth and each character, enemy or main player, has been meticulously animated to give them such a clean and flowing structure. Flipping back and forth between the living and dead worlds is seamless and sometimes offers a sharp contrast between each area. Sound design is also top notch with the kind of music you’d expect to be pumping out of your local Mexican Cantina or Taco emporium. 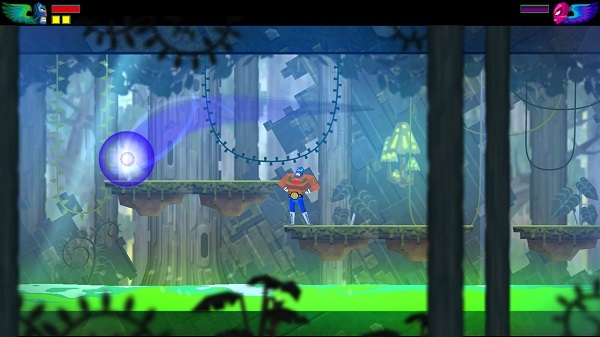 Guacamelee sits at around the six or seven hour mark for those that are taking a moderate play though. Rush and you might comfortably complete it in around four’ish hours. Stick around for all the chests and hidden areas then you may squeeze eight to ten hours from the game. Guacamelee also caters for (and by way of the leaderboards actively encourages) people to attempt speed runs of the game. As of writing the best time for a playthrough on Hard is a little over one hour of play. Playing the game for around four hours on the PS Vita and then shifting to the Playstation 3 for the rest of the time I found the ability to seamlessly (one you’ve manually uploaded or downloaded the save) continue from platform to platform a real bonus. Difference in play between the two systems is minimal. On the Vita you use the touch screen to change Juan between his human and chicken forms (you unlock Polo Power during the early stages) whereas on the PS3 this is assigned to a shoulder button. Likewise the dodge mechanic is executed by using the right stick on both platforms and also via a face button on the Vita or a shoulder button on the PS3. To be honest I found the controls more intuitive on the PS Vita mainly due to the fact the travel distance on the PS3’s Dualshock controllers are a little too far at times meaning you miss time actions which can lead to frustrations. Speaking of frustrations Guacamelee has plenty of them. This is the first time in years I’ve wanted to hurl a handheld console in sheer frustration – this is also partly why I swapped to the PS3 … it’s cheaper to replace a dualshock and a Vita! Guacamelee’s frustrations come from a sadistic and sporadic difficulty curve that ramps up around half to two thirds of the way through the game. The initial half or so of the game is all about exploration, platforming and some fun brawling. Moving in to the later stages the platforming gets a little fiddly and the combat get a lot annoying. 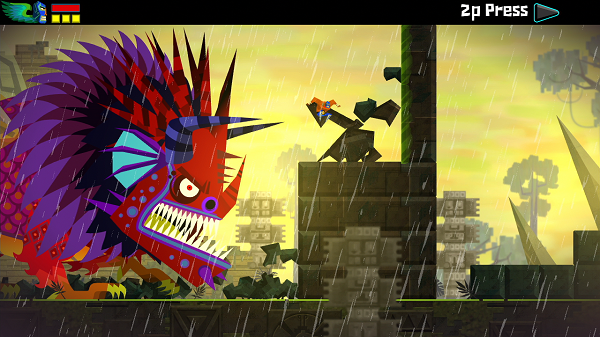 Guacamelee sees you using a series of melee strikes to take down your skeletal foes. This is all executed with the Square button by pummeling in rapid succession. To add to the mix when enemies get stunned a Triangle button symbol appears over their heads. You can then grab them and pull off some (unlockabale from the in game shop) fun wrestling-style moves – for instance a pile driver or suplex. Once you learn the art of flicking to and from the dead and living worlds you start to get enemies that exist in either plain. During a fight you will need to hit the shoulder button to transform back and forth between the worlds. This is fine apart from the fact that you can only cause damage to an enemy in the plain you currently inhabit – the enemy can damage you regardless of which one they are on – cue a lot of swapping back and forth and getting over-run by enemies. To add to this frustration Guacamelee also employs a trick from the recent Devil May Cry outing (and that borrowed from titles like Ikaruga etc) where you can only harm certain coloured enemies in certain ways. Red shielded enemies require the use fo the special upper-cut move, whereas blue need the shoulder dash move to break the shields. Once the shields are broken then they can be despatched in the same way as before. SO you end up with enemies in two plains of existence, both of which can harm you, and then these enemies also require special actions before you can attack them. When the game throws multiples of these enemies at you in the numerous “fight rooms” it locks you in things can get a little controller-smashy. Add to those the fact that animation sometimes have priority over actions and you get knocked down and can’t move for a second of so when hit – al the while enemies are swarming over to knock you down again the moment you get up. These frustrations also carry over into the boss battles which can also just degenerate into a frustrating mess at times..
Guacamelle can be played with a friend if you have a second controller or a Vita to use as one. The game works relatively well in a two player scenario until you reach some of the more tricky platforming areas that has you warping in and out of realms as you perform finger-twisting combinations on the controller. In these instance getting one player through it hard ehough let alone two. 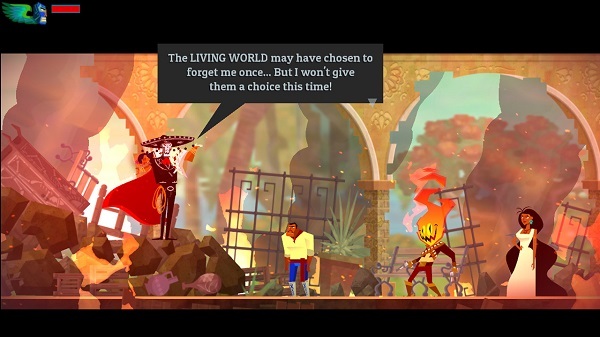 Guacamelee feels like it really should be played alone. Even with that in mind I have nothing but praise left for the team at Drinkbox. This is a wonderful next step on from their previous titles and shows such great promise in a very talented studio. For the price ($15) the game is very much worth it if you’re a platforming or old school gaming fan. If you happen to also own a Vita then there really is no excuse not to grab this tightly in both hands and skip merrily to the virtual counter.